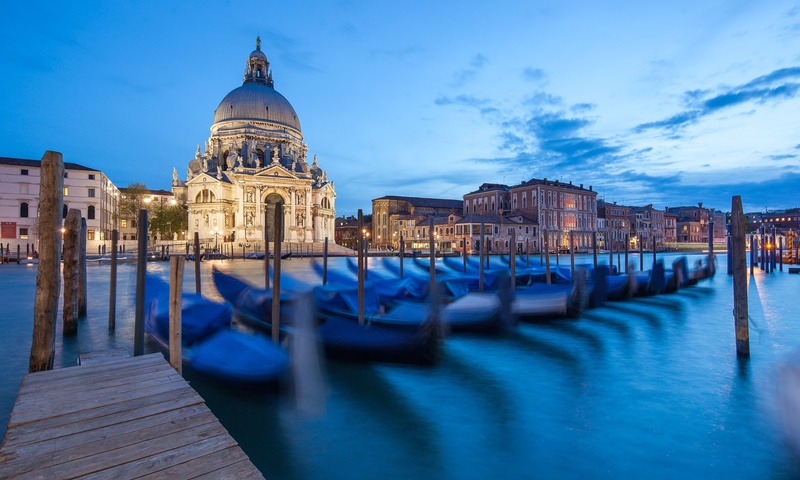 Danilo and Mariana chose a special photo session in Venice: they hired a photographer to portrait them strolling in the city dressed up with fancy costumes during the famous Venetian Carnival. I guess everyone of you has heard wonders about the Carnival in Venice. 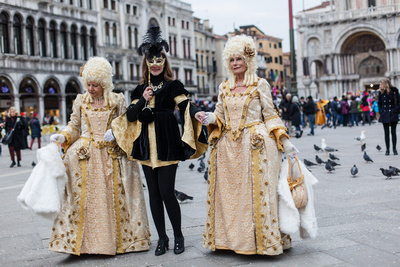 This is indeed one of the most famous Carnivals in the world due to its unique feature: for a whole week the city goes back to the Serenissima Republic times, people walk along the small alleys dressed up like 16th-17th century ladies and lords and ceremonies typical of the Republic period are performed in many Venetian campi (squares). 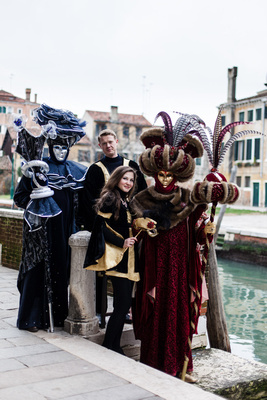 Italian and foreign visitors crowd the city to enjoy this special atmosphere and the sight of beautiful fancy-dress costumes and masks. During our informal photo session, we stopped in several romantic spots to shoot a few nice couple photographs. 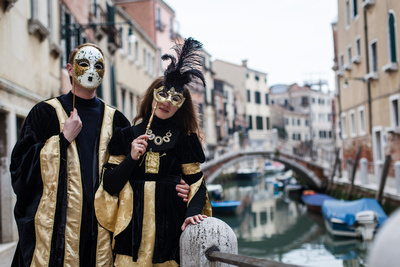 I lately had the chance to accompany a couple from Russia Danilo and Mariana during their visit to the Carnival in Venice and shot a special couple photo service with the two of them dressed up with elegant Venetian costumes and masks. 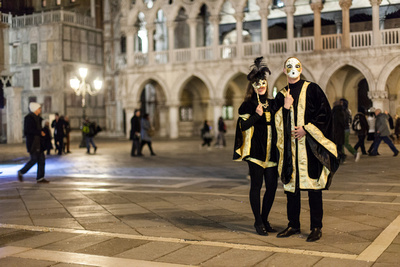 In order to get the best of this kind of “second honeymoon”, they reserved their masks and costumes back last November and hired me as their photographer for a romantic photo walk in Venice. Danilo and Mariana enjoyed playing and posing with their fancy Carnival costumes during our couple photo shooting in Venice. We started our informal photo shooting in San Tomà, a square in the Dorsoduro district, not far from Rialto bridge. We crossed several Venetian squares and bridges and squares and stopped in some romantic spots to shoot a few intense couple photo portraits, before approaching San Marco Square where the couple was warmly received by actors wearing luxurious colorful costumes, enriched by precious accessories (hats, masks, feathers and jewels). Along the way to San Marco Square during our couple photo walk, we met several actors dressed up with traditional Venetian costumes and we stopped for some colourful shots. Danilo and Mariana enjoyed their informal photo walk very much as it gave them the chance to really taste the Carnival’s unique mood and indulge in jokes and plays as Carnival allows you to do..at least once in a year! 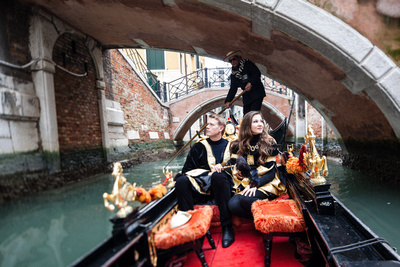 Our photo session in Venice ended with a romantic gondola tour which allowed me to take some photographs of the elegant couple with the background of the Venetian palaces along the Canal Grande. The couple treated themselves with a gondola tour and I had the chance to complete our informal photo walk with some couple shots with the background of Venetian channels. For further examples of informal photo walks in Venice see my website or some posts of this blog. Our photo shooting ended up in San Marco square where the couple posed with actors dressed up in traditional Venetian costumes. You might also enjoy some backstage shots of this couple photo portrait taken by my assistant Silvia Poli during the same day.